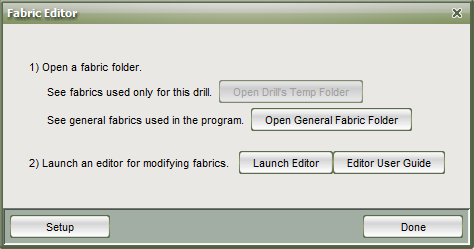 If fabrics were included with a drill (a drill package, or .3dz file) you can view these fabrics by selecting the Open Drill’s Temp Folder option. To see the fabric files that were included with 3D, choose Open General Fabric Folder. You can also launch an image editing software directly from 3D. Choose the Launch Editor button to customize fabrics. If you do not have an image editing software installed on your machine, click the Setup button to download the program we recommend.